Eric Hutcherson, senior vice president of human resources for the National Basketball Association, spoke at The Hun School of Princeton on Tuesday, March 3rd. During Mr. Hutcherson’s presentation, "Say Yes to Success," he identified five strategies for personal success in college admissions, job interviews, and life. Every single choice you make matters. Imagine you are your own company called You Inc., and imagine that each and every day someone is deciding whether or not to buy that company. 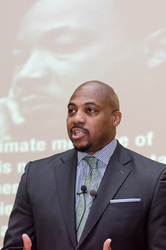 Eric Hutcherson, senior vice president of human resources for the National Basketball Association, spoke at The Hun School of Princeton on Tuesday, March 3rd. During Mr. Hutcherson’s presentation, "Say Yes to Success," he identified five strategies for personal success in college admissions, job interviews, and life. His lively presentation utilized audience participation, humor, and vast personal expertise to engage students in a discussion about personal branding. His appearance was part of The Hun School’s Centennial Speaker Series: A Global Perspective. The PRIDE Principle® drew students’ attention to the power of first impressions and the preparation necessary for that impression to carry impact. Mr. Hutcherson explained how people will assess someone they meet from thirty feet away, thirty inches away, and within their first thirty words. He explained how students’ decisions today – big and small – have the ability to open or close doors in the future. “Every single choice you make matters. Imagine you are your own company called You Inc., and imagine that each and every day someone is deciding whether or not to buy that company. The way you interact with others and communicate about yourself goes into the brand of You. You are your own company, and your brand is made up of the things that you do everyday.” said Mr. Hutcherson. Mr. Hutcherson is currently working on his first book, "The Pride Formula." As a senior vice president of the NBA for human resources, Mr. Hutcherson is responsible for compensation, employment and relations, learning and development, and recruiting. He currently serves as a member of The Hun School of Princeton Board of Trustees. He and his wife Linda have two sons Austin ’17 and Myles ’18, both of whom attend The Hun School. The Hun School will welcome Jason Collins, a second member of the NBA organization, on April 15th.